KUALA LUMPUR (Mar 27): Former prime minister Tun Dr Mahathir Mohamad today paid tribute to Singapore's founding father Lee Kuan Yew who died on Monday, sharing personal anecdotes of his interactions with the republic's first premier. In a blog posting entitled "Kuan Yew and I", the statesman expressed sadness over Lee's death although they had not been close. "No matter how friendly or unfriendly we are, the passing away of a man you know well saddens you. "Now Kuan Yew is no more. His passage marks the end of the period when those who fought for independence led their countries and knew the value of independence. "Asean lost a strong leadership after President Suharto and Lee Kuan Yew," he wrote on his blog “chedet”, referring to another Asean strongman, former Indonesian president Suharto. Both statesmen shared a somewhat turbulent relationship which Dr Mahathir acknowledged, saying that they could not agree on most issues. One matter which they agreed on, however, was on advancing Malaysia and Singapore clock times. Dr Mahathir said when he first became prime minister in 1981, he paid a courtesy call to Lee, which he described as "friendly". "It was a friendly call and he immediately agreed to my proposal that the Malaysia and Singapore times which had always been the same should be advanced by half an hour. "I explained that it would be easier adjusting our time when travelling as we would fall within the time zones fixed for the whole world at one-hour intervals," Dr Mahathir said. Malaysia's longest serving prime minister said he had heard of Lee while he was studying medicine in Singapore as he had read about Lee's defence of labour unions. He also recounted his first meeting with Lee, which was in Parliament in 1964, a year after Singapore joined Malaysia. "We crossed swords many time during the debates. But there was no enmity, only differences in our views of what was good for the newborn nation. 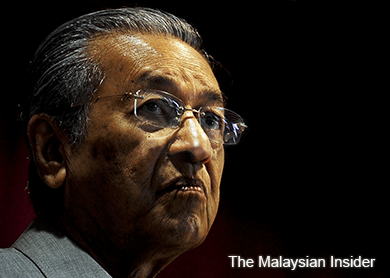 Dr Mahathir also said Malaysia's first prime minister Tunku Abdul Rahman attended the inaugural meeting of Lee's PAP party, and was friendly with him. "He believed Kuan Yew was a bastion against communism. But when the PAP contested in the Malaysian elections in 1964 with Malaysian Malaysia as its slogan, Tunku felt that the PAP’s presence in Malaysia was going to be disruptive for the country," he said. He also recounted Lee's personal gesture when he (Dr Mahathir) had a heart attack in 1989 and required open heart surgery. Lee rang up Dr Mahathir's wife, Tun Dr Siti Hasmah Mohd Ali, asking her to delay the operation. This was because Lee had arranged for the best heart surgeon, a Singaporean living in Australia, to do the operation. Dr Mahathir said when both of them attended the Nihon Keizai Shimbun annual conference on the Future of Asia in Tokyo, Japan, he went up to Lee during dinner to ask about his wellbeing. "We sat down together to chat and the Japanese photographers took our pictures promising not to put it in the press. I wouldn’t mind even if they did. But I suppose people will make all kinds of stories about it," he added. Lee, who was Singapore’s first prime minister in 1959, died at 3.18am at the Singapore General Hospital, where he had been admitted on February 5 for pneumonia. A British-educated lawyer, Lee is widely credited with building Singapore into one of the world's wealthiest nations on a per capita basis. A period of national mourning had been declared until March 29. Lee's body in lying in state at Parliament House until tomorrow for the public to pay their respects. The state funeral will be held at 2pm on March 29 at the University Cultural Centre, National University of Singapore. He will be cremated at the Mandai Crematorium.